Toes of a pahoehoe flow advance across a road in Kalapana on the east rift zone of Kilauea Volcano, Hawaii. Credit: J. D. Griggs / U.S. Geological Survey. 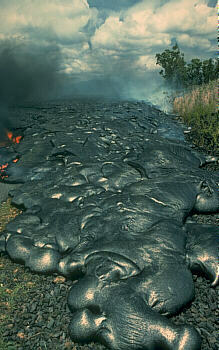 Pahoehoe is a Hawaiian term for basaltic lava that has a smooth, hummocky, or ropy surface. A pahoehoe flow typically advances as a series of small lobes and toes that continually break out from a cooled crust. The surface texture of pahoehoe flows varies widely, displaying all kinds of bizarre shapes often referred to as lava sculpture.